We might have thought it from time to time — especially when I lived there*. But I never would say it out loud, let alone have been so bold as to put it into a headline at USA Today. Talking about Utah election results — it seems only a short while ago Scott Matheson won election as governor, and Orrin Hatch as U.S. Senator, and now Matheson’s kid, Jim Matheson, finishes his 6th term in the U.S. House and got elected to a 7th, and Hatch is the longest-serving Republican U.S. Senator; Jim Matheson scraped out a victory over GOP rock star Mia Love . . . and so on — and Mr. Jim Butler, the grammar and spelling stickler, called my attention to it. 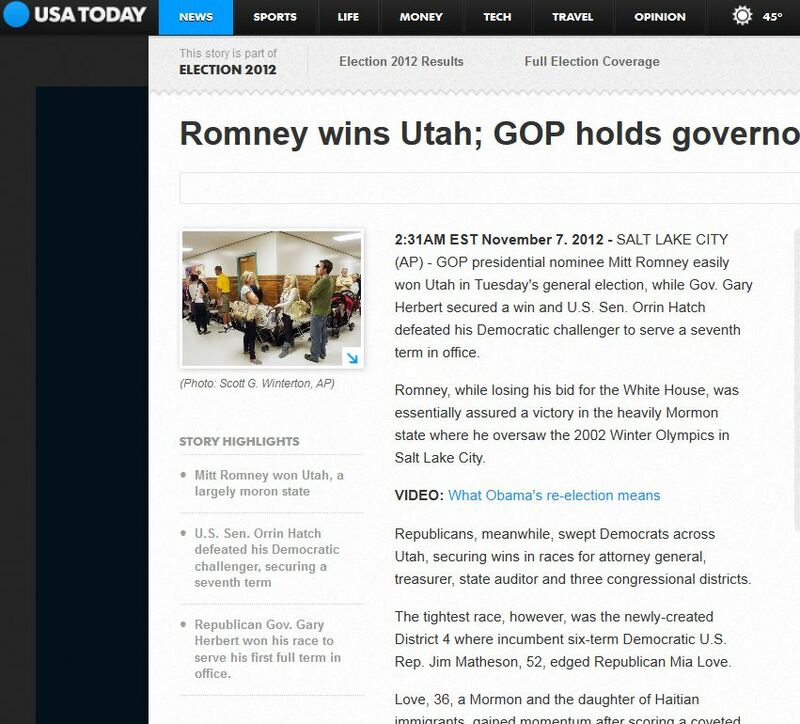 Look, there on the left hand side, under “Story Highlights,” where it mentions that “Mitt Romney won Utah” — how does it describe the state? Mostly what? Unfortunate typographical error in USA Today — there should be two of the letter “m” in “Mormon.” Screen shot courtesy of Kathryn Knowles. On the one hand, you wonder, do they have copy editors at USA Today? Then it strikes you: Yes, yes they do. They can’t say that, can they? It’s probably an unintentional slip, an unintended and unexpected blurting out of some truth or other. Will USA Today ever correct it? We have such a deal! When Annette’s Place is closed or lazy, we walk to an Einstein’s, which is just across a parking lot from Starbuck’s. Einstein’s coffee is as good as Starbucks and cheaper, and their mudslides, bagels, and other treats are much better than Starbucks. Or we just walk next door to a newly opened smoke shop, which also sells great coffee drinks. They open at 7:00 most days and that’s usually early enough. Obviously you should move to Salt Lake. We have fabulous, local coffee shops and beer makers. Coffee Garden, Raw Bean, Beans & Brews, Squatter’s, Wasatch Brewing Co., Epic, and the great High West Brewery in Park City, making the best Rye, Whiskey and Vodka made in the US. A Ski-in distillery, no less. There are no ski-in distilleries in Texas, I’ll tell you that. First you must get to Capitol Reef National Park, in Utah — one of Utah’s unfairly large number of five National Parks. Then you take your “high-clearance vehicle” (not necessarily 4-wheel drive) out on the dirt roads in Cathedral Valley, and you hope for a crystal blue sky like this one. Then you happen to get there just as the sun is right at the peak of the formation . . .
You had to be there. Mike Saemisch was there just over a week ago, on October 29, 2012, and fortunately caught this photograph with the Sun as part of a sparkling spire on a sandstone formation known as the Temple of the Sun. Digital photography changes the way one tours these places. Fortunately. Take the kids, and make sure they find it on a map so they can use your trip as fodder for their 9th grade geography class. 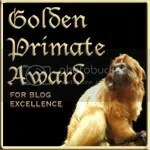 See Hal’s photos here, at his blog. He’s also got posts on Bryce Canyon NP and Kodachrome Basin State Park, with Grosvenor Arch, named after the father of our old friend Gil Grosvenor. Kodachrome, alas, is a thing of the past, killed by digital photography. Be sure to take a good digital camera and a clear memory chip when you go, to honor the name of the place, and the Grosvenors (of National Geographic Society fame). Kathryn and I spent great night as one of only two groups camping in Kodachrome Basin, near the height of tourist season in August, in the 1980s. We got there in a Chrysler Cordoba; better to use at least an SUV. 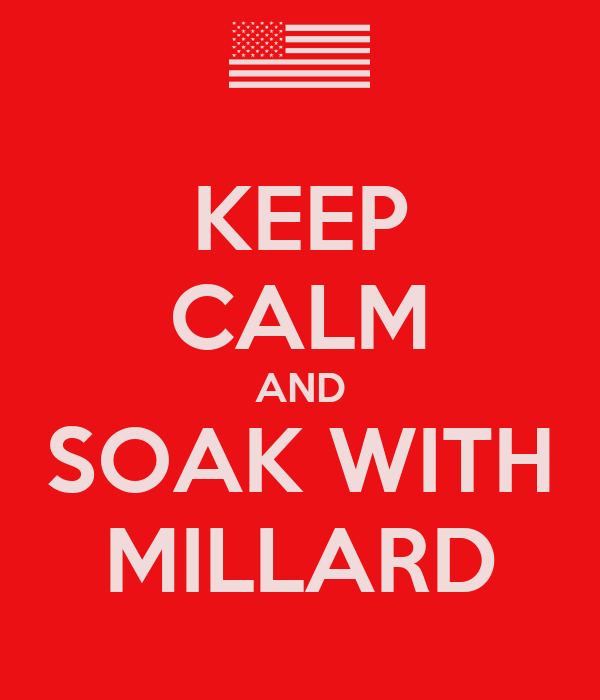 You are currently browsing the Millard Fillmore's Bathtub blog archives for the day Thursday, November 8th, 2012.